This 4WD-equipped vehicle handles any condition on- or off-road with the sure footedness of a mountain goat. With unequaled traction and stability, you'll drive with confidence in any weather with this Shadow Black 2018 4WD Ford F-150 XL 4WD SuperCrew 5.5' Box. Just what you've been looking for. With quality in mind, this vehicle is the perfect addition to take home. The look is unmistakably Ford, the smooth contours and cutting-edge technology of this Ford F-150 XL 4WD SuperCrew 5.5' Box will definitely turn heads. 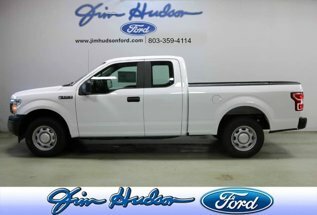 There is no reason why you shouldn't buy this Ford F-150 XL 4WD SuperCrew 5.5' Box. It is incomparable for the price and quality.